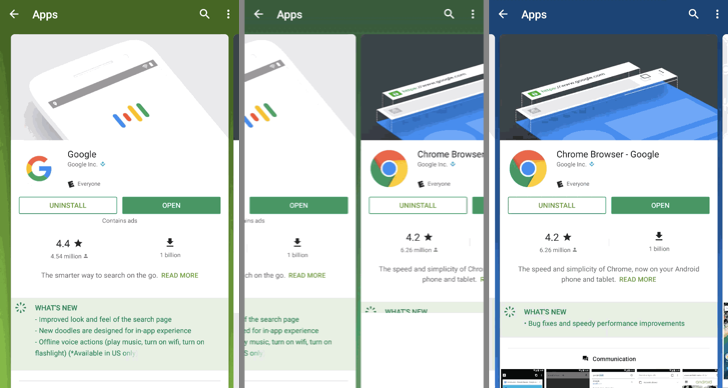 Google iterates a lot on the Play Store - the new shade of green, darker and richer than the previous one - is currently rolling out globally, along with the big uninstall button and tweaked list view for apps. We've now had wind of another test, using big cards for apps that can be horizontally swiped through in search results. When searching for an app, tapping a result will take you to this new view, where you see the current content but instead of fullscreen, it is contained in a card. Scrolling down makes the card bigger - so the view is as it is now - and scrolling up puts it back in a card. Swiping horizontally, left or right, shows the other results of the search. It's not clear if this is a test or if it's slowly rolling out via a server-side switch. We know Google tests a large amount of things, most of which go unnoticed; this may simply be one of them - after all, the company has just tweaked the search results layout a few weeks ago, with a bigger first result and more prominent install button. Either way, if we hear anything else, we'll let you know.